Can You Create a Mission-Related Petting Zoo? 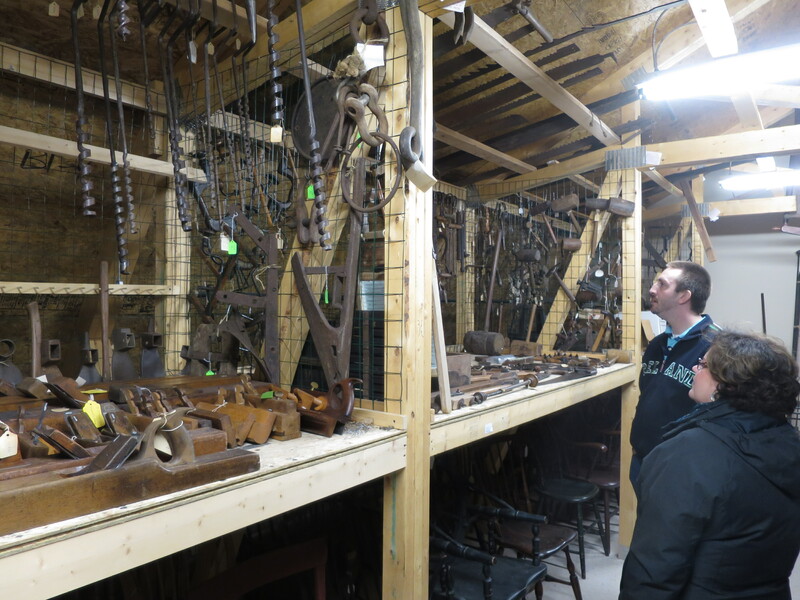 A clever storage area for odd-shaped tools and equipment at Strawbery Banke. In my workshop, we discuss the importance of combining mission and sustainability using one of my favorite tools: the Double-Bottom Line. I often joke that if historic sites just wanted to increase attendance, they might as well become petting zoos of puppies and kittens. Incredibly, Strawbery Banke has figured out how to make a mission-related puppy zoo in an event called, “Baby Animals.” For one week, visitors can learn about a dozen heritage breeds such as Jacob sheep, Nigerian goats, and Gloucester Old Spot pigs. No, they can’t be petted but families can watch lambs, kids, and piglets play, eat, and sleep. For those who are really interested, there are a couple lectures and a “meet the animals” program for children ages 4 to 8 where they can have a snack, feed the animals, and create a take-home gift for $25. What a clever idea! 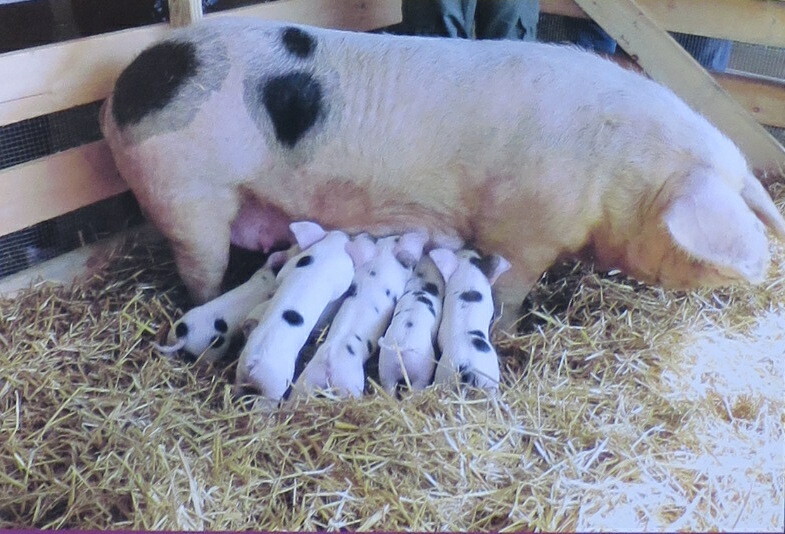 I’ve attached the brochure on Baby Animals at Strawberry Banke with more details. This entry was posted in Community engagement, Fundraising, Governance and management, Historical interpretation and tagged New Hampshire, Strawbery Banke Museum on April 10, 2017 by Max van Balgooy. “Reinventing the Historic House Museum” on March 22, 2017 at Cliveden in Philadelphia, PA. Ken Turino and I will explore techniques, processes, and examples for reimaging historic house museums, using Cliveden as a case study and exercises that are based on your historic site. Unfortunately, this workshop has already sold out with fifty participants, however, additional workshops are under consideration in other regions. These two workshops are offered annually and travel around the country, often at the request from a historic site or house museum. If you’d like to bring one of these workshops to your region, contact Amber Mitchell at AASLH at 615-320-3203 x 814. This entry was posted in Governance and management, Historical interpretation, Training and tagged American Association for State and Local History, Cliveden, New Hampshire, Pennsylvania, Strawbery Banke Museum on February 23, 2017 by Max van Balgooy. A sold-out crowd of history enthusiasts packed the auditorium at the Strawbery Banke Museum in Portsmouth, New Hampshire on April 21 to discuss ways to reinvent the house museum. Sponsored by the American Association for State and Local History and the New England Museum Association, the one-day workshop explored ways that historic house museums can more successfully engage their community and improve their financial sustainability. The morning featured several presentations and the afternoon was a hands-on workshop at a nearby historic house. I opened the day with a process for developing a plan and then focused on Michael Porter’s Five Forces, a diagnostic tool that’s superior to SWOT for assessing a house museum’s strategic position. Ken Turino of Historic New England provided a smorgasbord of ideas from house museums around the county to rethink existing conceptions. Larry Yerdon, CEO of the Strawbery Banke Museum, discussed ways they are introducing new programs and activities to be both more engaging and financially sustainable. After lunch, we gathered at the Governor John Langdon House, a property of Historic New England, where Joanne Flaherty and Linda Marshall led us on a quick inspection of the property and described its operations and recent efforts to use it for temporary exhibits. Then the audience became temporary consultants using the Five Forces, analyzing existing and potential competition for exhibits, interests from visitors, and collaborating with exhibit providers. The consensus seemed to be that an exhibit program could have a competitive advantage if it focused on the collections of Historic New England and may be better suited for rooms other than the parlor or dining room, which are architecturally significant. This workshop will travel next to Atlanta, Georgia on June 12, where we’ll be using the Margaret Mitchell House as the case study. To register and for more information, visit AASLH.org. 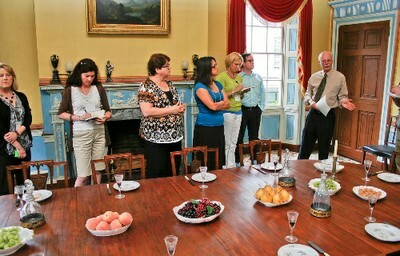 This entry was posted in Community engagement, Governance and management, Historical interpretation, Training and tagged American Association for State and Local History, Five Forces, Governor John Langdon House, Joanne Flaherty, Ken Turino, Larry Yerdon, Linda Marshall, Michael Porter, New England Museum Association, New Hampshire, Strawbery Banke Museum on May 5, 2015 by Max van Balgooy. Want to Sharpen Your Historic Site Management Skills? If you manage an historic site or house museum, there are several ways to sharpen your skills in the next few months. 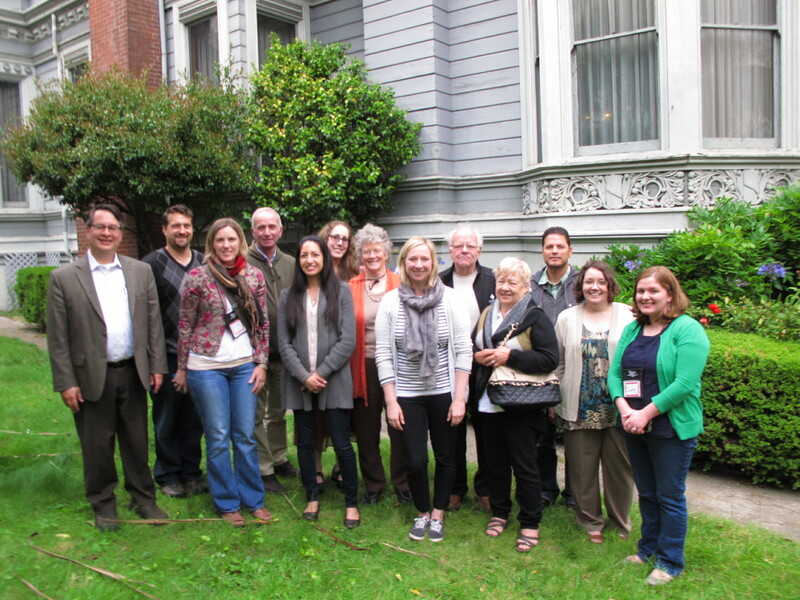 Historic House Museum workshop at the Haas-Lilienthal House in San Francisco, 2014. For nearly fifteen years, the American Association for State and Local History has offered a two-day workshop on historic house museum issues and operations and next month it will be in Charleston, South Carolina on February 26-27, 2015. Held in partnership with the Historic Charleston Foundation (one of the oldest historic preservation organizations in the US) and co-taught by me and Dr. George McDaniel of Drayton Hall, we’ll examine a wide range of topics from the unique perspective of house museums and historic sites, including leadership, interpretation, disaster preparedness, membership, and audience, through interactive presentations, group discussions, and site-specific exercises. You’ll leave with a better sense of how your organization can better fulfill its mission and be more financially sustainable. Registration is $345, $270 for AASLH members, plus there’s a $40 discount if you register by January 22. Be sure to add a day to explore the historic sites in Charleston–it’s one of the best places to see a wide variety of visitor experiences in one place. New this year is “Re-inventing the Historic House Museum,” a one-day workshop offering current thinking, practical information, and solutions to the challenges facing historic sites. The historic house museum in America is not dead nor are most of them dying. The field, however, needs to reflect and renew as the world around our historic sites continues to change. This workshop was inspired by a sold-out symposium presented by the Historic House Museum Consortium of Washington, DC at Gunston Hall in March 2014, and now has been taken nationally to various regions by the American Association for State and Local History. Ken Turino of Historic New England and I will be giving the core presentations and the others will vary to take advantage of the workshop location. We’ll be at Strawbery Banke in New Hampshire on April 21, 2015 and the Margaret Mitchell House in Georgia on June 12, 2015. Registration is $170; $95 for members of AASLH and NEMA (for April 21). This entry was posted in Governance and management, Resources, Training and tagged American Association for State and Local History, George McDaniel, Georgia, Historic Charleston Foundation, Historic House Museum Consortium of Washington, Historic New England, Ken Turino, Margaret Mitchell House, New Hampshire, South Carolina, Strawbery Banke on January 13, 2015 by Max van Balgooy. This 38:00 freshly produced documentary follows the transformation of an historic clothing factory in Lebanon, NH into an art center. Directed by Ken Turino of Historic New England and produced in collaboration with AVA Gallery and Community Access Television of Upper Valley, it features interviews, oral histories, and historic images. This entry was posted in Historic preservation, Historical interpretation and tagged Historic New England, New Hampshire, Video on February 28, 2013 by Max van Balgooy. Historic New England presents the tenth annual Program in New England Studies (PINES), an intensive learning experience with lectures by curators and architectural historians, workshops, and behind-the-scenes tours of Historic New England’s properties and collections, as well as of other museums and private homes in the region. This year’s program begins on June 17 with Cary Carson on the 17th century in the Boardman House and ends on June 22 with Richard Nylander and Nancy Carlisle on the Colonial Revival at Beauport. This entry was posted in Collections, Historic preservation, Historical interpretation, History, Training and tagged Connecticut, Historic New England, Ken Turino, Maine, Massachusetts, New Hampshire on February 14, 2013 by Max van Balgooy.